I'd like to replace the front door & side lights. 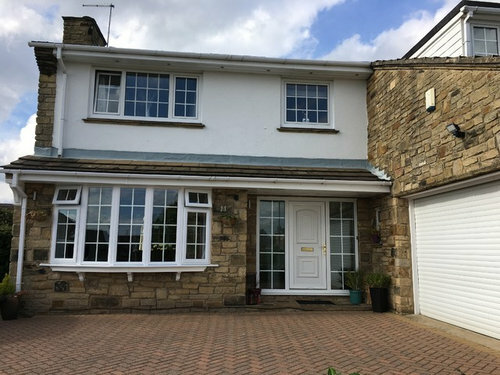 At the moment it's white Upvc & would like to replace with something more substantial. I like oak but not sure it would work with the windows. Would a colour work better? Any ideas? Hmmm. First thing to consider is would removing those side-light sections badly affect the light levels in the hallway behind the front door? Are you going to regret the total loss of light? I think maybe you will. So I would like to suggest that you go with new glass-panels that have 'frosted' opaque glass in them (perhaps you could get the number or name of your house etched into the frosting too). Then I would go with a coloured door. 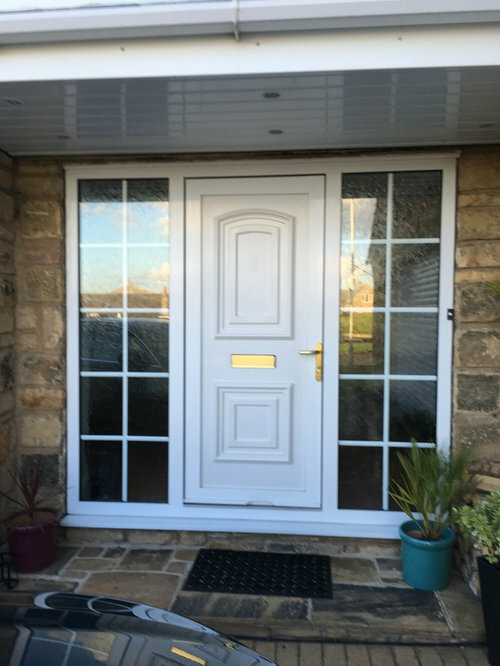 Many of the composite doors available on the market look super-smart and have all the benefits of the extra security and low-maintenance. Navy blue would look great against the turquoise of that plant pot, giving you a great excuse to get two more of those to group in a pleasing collection of three. Hope that's helpful. Good luck. 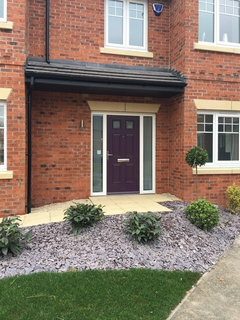 Hi I think light oak would look nice, but think you should have keep the side panels but have light oak with opaque glass, like "red interior design" idea of having your house number etched in, light oak will blend well with the stone facia. Thank you for your response, yes I would like to keep the light in the hallway so am keen to keep the side panels, although I'm now thinking of a wider door with narrower side panels as previously suggested. I would like a classic look that won't date, perhaps something with some glass in the door too which would go with the windows. I'm keen to avoid black or white but navy blue is a good choice. I would also like to add silver door furnishings, again for a classic look. I've always really wanted a solid oak door but I just can't quite picture it on this house. Do you think it could work? Thank you, I feel like I might actually be getting somewhere with my door project now. If I go for oak would you keep the frame white to match the windows? The garage door is also white. A good way of checking light levels is to tape wallpaper over the sidelights to see if it makes a big difference to your hallway. If you are slimming your sidelights down this will still change your light levels slightly. 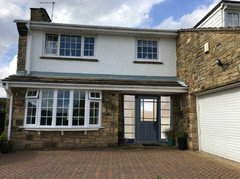 Have you considered a half glazed door with narrow glazing bars? This would mirror the glazing bars on your windows and you could have frosted satin obscure glazing for privacy. Thanks again for some great responses & ideas. I'll try the wallpaper trick this weekend to see how much difference it makes to the light. I've got lots of great ideas to consider now! I hadn't really thought about changing the colour of the rendering but I can see that would work with an oak door, it would soften the overall look. What was becoming a bit of a burden to work out has now turned into an exciting challenge! Thanks again for all your ideas. 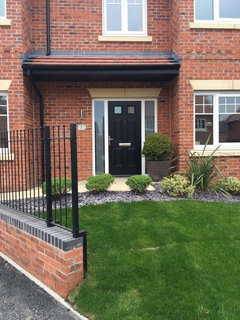 Here are a couple of examples of masterdor engineered timber doors in timber clad aluminium frames with farrow and ball colour range - it means you can have a slim elegant outer frame without door "bounce"
Plenty of light in but with toughened modesty glass protecting your privacy. Is it strange to have the dining room at front of house by front door? garage door conversion design ideas-please help!!! !